It’s easy to think that if something is safe for us to eat, it must be safe for our dogs too. But that’s not always true – a few of the foods we love can be bad for, or toxic to, dogs. It’s important to know which ones, so you don’t accidentally give your dog something that could make them unwell. 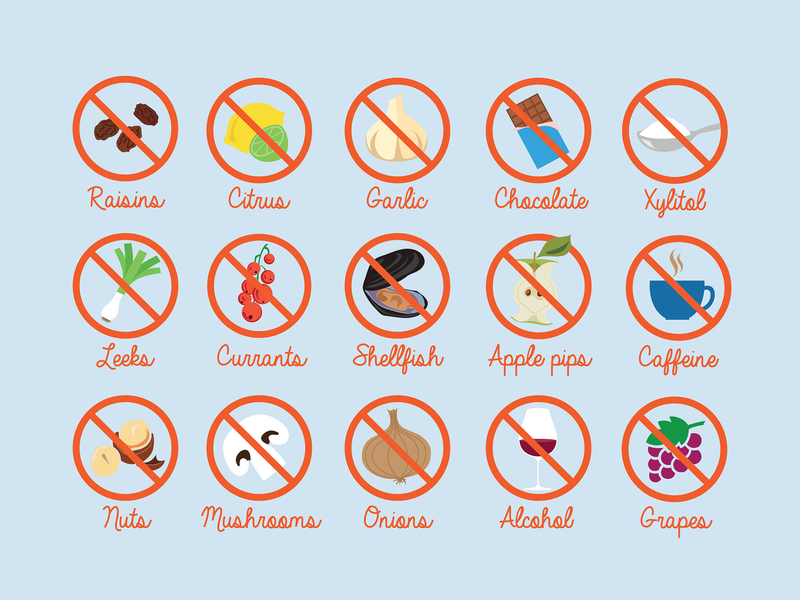 Here’s our veterinary and nutritionist team’s rundown of foods to keep out of your dog’s reach. Alcohol affects dogs more intensely than it affects humans, and can cause damage to multiple organs, like kidneys, liver and stomach. Be particularly careful if sweet alcoholic drinks are around, as sugar can cover up the alcohol flavour that would normally put dogs off. While apple is OK to give your dog in small amounts, it’s important not to serve the whole fruit. That’s because apple pips contain cyanide. Ditch the core, and serve tasty pip-free slices instead. The stimulant effect of caffeine is bad news for dogs – it can make them anxious, hyperactive, and affect their heart. In serious cases, it can even cause them to collapse or have a seizure. The high caffeine content of coffee puts it among the worst offenders, so always keep your morning brew out of your dog’s reach. The fungus that makes blue cheese taste delicious to humans is far from friendly to our pet pals. That’s because it releases roquefortine C – a toxin that, in severe cases, can cause tremors and seizures. Chocolate’s well known for being poisonous to dogs – it contains theobromine, a substance similar to caffeine. All chocolate is a no-go, but dark chocolate should be kept especially off-limits, thanks to higher levels of this harmful substance. While it’s not clear exactly what makes these foods toxic for dogs, they’ve been associated with symptoms as severe as kidney failure – so they’re best avoided. All contain thiosulphate, a substance known to cause tummy troubles and a severe form of anemia. It’s not just the whole vegetables you need to keep out of your dog’s reach – garlic and onion flavourings can appear in almost any savoury dish, including baby food. Look out for this common artificial sweetener that’s toxic for dogs – it’s often in things you wouldn’t expect, like baked goods and peanut butter. What other food can dogs not eat? The stone poses a choking hazard, but that’s not the only reason to keep your dog away from avocado. This rich fruit contains persin – a chemical that doesn’t agree with dogs’ digestion. Give the dog a bone’ is fine for a nursery rhyme, but in real life dogs and bones are a riskier mix. Stored, raw bones can carry nasty bacteria that may upset your dog’s stomach. Meanwhile, cooked bones are brittle – pieces can break off and get stuck in your dog’s throat or digestive system, or even pierce your dog’s intestine walls. Read more: Myth Buster: Give the dog a bone? Ignore the videos of dogs eating lemons; citrus fruits and dogs aren’t a good combination. The citric acid and essential oils found in oranges, lemons, limes and grapefruit are known to upset a dog’s digestive system – among other symptoms. Rich, fatty foods have a nutrient balance that’s out of sync with what’s healthy for dogs. Salty foods can make your dog thirsty, and need to urinate more. That means crisps and chips are off the menu. Dogs can’t digest lactose – a type of sugar found in milk – so dairy products often cause digestive upsets in our canine companions. It’s best to keep mushrooms out of your dog’s diet altogether, so they’re not tempted by the potentially poisonous ones you see out and about. Nuts may be healthy for humans, but they can leave dogs extremely unwell. Macadamia nuts are particularly problematic, as they can cause vomiting, fever and muscle weakness. Make sure you bin out of date food somewhere your dog can’t get to it, as it’s likely to make them unwell. If it’s past the point where you’d eat it, don’t let your dog eat it either. Dogs can eat fish, so you might expect shellfish to be fine too. But foods like crab, prawns and crayfish can contain pathogens that make your dog extremely unwell. Shellfish can also cause an allergic reaction in dogs, thanks to high levels of an amino acid called histidine. How can I tell if my dog has eaten something that’s bad for them? Reactions can vary from seeming out of sorts to something more serious, like vomiting, diarrhoea, or in extreme cases, seizure – it all depends on what they ate, how much, and how long ago. A regular mealtime schedule can help you keep track of your dog’s digestive health, so you immediately spot anything out of the ordinary. What should I do if my dog has eaten something they shouldn’t? Take your dog to the vet to get checked over as soon as you notice something’s not right – or when you suspect they’ve eaten a food that’s bad for dogs. Even if you’re wrong, it’s best to know they’re OK.
How can I stop my dog eating something that’s bad for them? The best way to keep your dog’s diet 100% safe is to serve food created especially for them. Every tails.com dog gets a tailor-made kibble blend, plus the choice of a wide range of nutritionally balanced wet food and treats. The result: complete confidence you’re serving food that supports your dog’s health. If you’d like to know more about foods to avoid feeding dogs, ask our veterinary and nutritionist team – get in touch at hello@tails.com. Hey Emily, this list is very helpful! I’m going to print this, and leave it on the refrigerator as a reminder for everyone in my household. My vet suggested Piriton tablets three times a day. Though it did clear up the red eyes it didn’t really stop the itching, so I would be grateful if anybody has any suggestions too.